Severe, chronic pulmonary hypertension in childhood is uncommon, difficult to treat, and carries a poor prognosis. Sildenafil (Viagra, Pfizer) has been used successfully in adults with pulmonary hypertension as monotherapy or in combination with inhaled prostacyclin. Here we report on its use in three children. Guidelines for the treatment of pulmonary hypertension stress the importance of accurate diagnosis and early referral to a specialist centre.1 Severe pulmonary hypertension is characterised by extensive remodelling of the pulmonary vasculature, with consequent deleterious hypertrophic changes in the right ventricle. Before the advent of prostacyclin therapy, the prognosis in childhood was bleak, with a median survival of 10 months.2 Intravenous prostacyclin infusion reduces symptoms and mortality,3 and in combination with treatment of hypoxaemia with oxygen is currently the gold standard treatment.2 Treatment with continuous intravenous infusions is particularly difficult in childhood and beset with potential complications, hence an effective oral treatment would be particularly attractive. Until recently, effective oral therapy has been limited to relatively unselective agents such as nifedipine. This is only useful in patients who respond acutely to vasodilator testing at cardiac catheterisation (>20% fall in mean pulmonary artery pressure without a fall in cardiac output). This is achieved in about a quarter of patients.1 Sildenafil is a more selective agent, which relaxes pulmonary vascular smooth muscle by inhibiting cyclic guanosine monophosphate (cGMP) binding, cGMP specific phosphodiesterase, which is concentrated in the lungs. Patient 1 presented with transposition of the great arteries shortly after birth. Following balloon atrial septostomy, he had an uncomplicated arterial switch operation at 22 days. The development of progressive exercise intolerance, with echocardiographic evidence of right ventricular hypertension, led to cardiac catheterisation at seven years. This revealed severe pulmonary hypertension (equal to systemic), for which no respiratory cause could be found. The pulmonary arteriolar resistance was very high, at 13.9 Wood units.m2, and showed no reversibility following administration of nitric oxide. Following an oral test dose of 0.5 mg/kg he commenced sildenafil 1 mg/kg six hourly. Increases in sildenafil were associated with decreasing symptoms and increasing exercise tolerance, as detailed in fig 1. At 1.5 mg/kg six hourly he underwent transcatheter stent fenestration of the atrial septum. This provides the safety of a permanent atrial septal defect held patent by a dumbbell shaped stent, permitting right to left inter-atrial flow during potential right ventricular decompensation, hence preventing a fall in cardiac output at the expense of worsening cyanosis. The pulmonary arteriolar resistance had fallen to 10.3 Wood units.m2. When established on sildenafil at 2 mg/kg six hourly, he managed 9 minutes 14 seconds of the Bruce protocol, almost twice as long as his pretreatment exercise test. 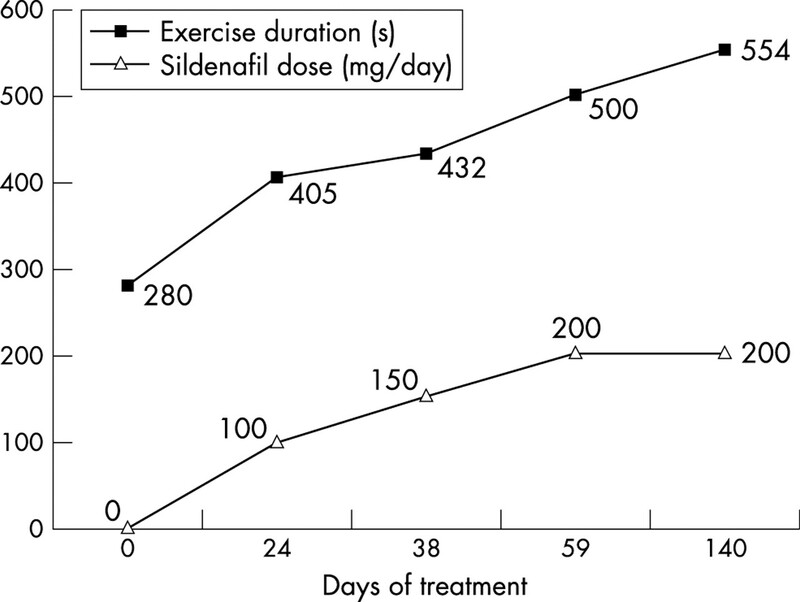 Exercise tolerance following introduction of sildenafil. Patient 2 developed fever, cough, poor appetite, and lethargy shortly after his second birthday. He was cyanosed with mild respiratory distress. After antibiotics and antituberculosis therapy he was transferred to our centre. Open lung biopsy revealed interstitial pneumonitis. Despite treatment with methotrexate, hydroxychloroquine, and steroids he remained diurnally oxygen dependent. After five months echocardiography revealed severe pulmonary hypertension. Prostacyclin infusion dramatically improved symptoms but was impractical for home use. He was commenced on sildenafil and prostacyclin was discontinued. Stepwise increments to 2 mg/kg six hourly were well tolerated. He stopped desaturating, became cheerful, playful, and regained his appetite, permitting discharge home. Despite intensive therapy for interstitial pneumonitis (including cyclosporin), this continued to progress and he died quietly at home two months later. Patient 3 weighed 1.7 kg at term. He required oxygen for five days and was discharged at four weeks. At four months he represented with severe pneumonitis requiring four weeks of ventilation. At one year he remained oxygen dependent with severe pulmonary hypertension and required two admissions to the intensive care unit for ventilation and treatment with inhaled nitric oxide. With further prolonged desaturations his parents agreed that ventilation should not be reinitiated. In an effort to palliate his symptoms (and possibly allow time at home) he was started on sildenafil 0.5 mg/kg/dose which was increased to 2 mg/kg six hourly over two weeks. However, symptoms and oxygen requirement were unchanged, and death occurred two days after reaching the maximum dose. Description of the use of sildenafil in childhood is limited to a single case report.6 Severe, chronic pulmonary hypertension in childhood is usually associated with chronic lung disease or may be a sequela of interstitial pneumonitis. The effect of sildenafil on pulmonary vasculature is independent of the underlying cause, and thus in paediatric practice may be useful in a range of settings. To our knowledge it has already been used successfully to palliate primary pulmonary hypertension, severe chronic lung disease, and persistent pulmonary hypertension of the newborn. There are limited data available to suggest dosage regimens. In adults 100 mg oral sildenafil abolishes hypoxia induced increases in pulmonary arterial pressure.7 Due to the paucity of data we have adopted a cautious approach to the introduction of sildenafil. Following a 0.5 mg/kg test dose we would now advocate that sildenafil is administered six hourly, with increments of 0.5 mg/kg/dose, and a target maintenance dose of 2 mg/kg six hourly. Although the biological half life of sildenafil is relatively short (four hours), we have not found it necessary to increase the frequency. None of our patients experienced systemic hypotension. Although patient 2 had short lived erections, he was untroubled by these. Nausea, flushing, and rashes were not seen. We had one treatment failure (patient 3), although clearly this may have been a case of “too little, too late”. Patient 1 continued to derive benefit for at least nine months after the start of treatment. In patient 2, treatment allowed our patient valuable time at home with his family, with a substantial reduction in symptoms. Recent studies have identified other potential oral treatments for pulmonary hypertension. In particular, the endothelin receptor antagonists bosentan8 and sitaxsentan9 have been reported to be effective in treating pulmonary hypertension. It remains to be seen if they are safer, more effective or even complementary to sildenafil. Sildenafil is expensive. The established dose for patient 1 was 50 mg (2 mg/kg) six hourly, costing £19.34 per day or £7059 per annum (approximately equivalent to €27 or US$32 per day, or €9913 or US$11 664 per annum). However, this compares favourably with the estimated costs of one year’s treatment with intravenous epoprostenol (£25 342, €35 590, or US$41 873) or inhaled prostacyclin (£17 520, €24 604, or US$28 947) in the same patient. Moreover, patients remain unhindered by infusion pumps, the inherent difficulties of permanent intravenous lines, or the inconvenience of four hourly nebulisers. Clearly further work, ideally a multicentre randomised controlled trial, needs to be done to establish the safety and efficacy of sildenafil in childhood. However, given the poor prognosis and lack of other proven oral treatments, we conclude that sildenafil provides a useful treatment option in a child with severe, chronic pulmonary hypertension. Gibbs JSR. Recommendations on the management of pulmonary hypertension in clinical practice. Heart2001;86(suppl 1):i1–i13. Barst RJ, Rubin LJ, Long WA, et al. A comparison of continuous intravenous epoprostenol (prostacyclin) with conventional therapy for primary pulmonary hypertension. The primary pulmonary hypertension group. N Engl J Med1996;334:296–302. Prasad S, Wilkinson J, Gatzoulis MA. Sildenafil in primary pulmonary hypertension. N Engl J Med2000;343:1342. Ghofrani HA, Wiedemann R, Rods F, et al. Combination therapy with oral sildenafil and inhaled iloprost for severe pulmonary hypertension. Ann Intern Med2002;136:515–22. Abrams D, Schulze-Neick I, Magee AG. Sildenafil as a selective pulmonary vasodilator in childhood primary pulmonary hypertension. Heart2000;84:e4. Zhao L, Mason NA, Morrell NW, et al. Sildenafil inhibits hypoxia-induced pulmonary hypertension. Circulation2001;104:424–8. Barst RJ, Rich S, Widlitz A, et al. Clinical efficacy of sitaxsentan, an endothelin-A receptor antagonist, in patients with pulmonary arterial hypertension. Chest2002;121:1860–8.